Everyone's favourite leprechaun is back in Rainbow Riches Fortune Favours! The popular Rainbow Riches theme has a fresh new look with a number of features sure to keep players searching for the end of the rainbow! 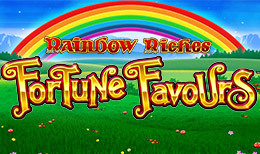 Rainbow Riches Fortune Favours is an online slots game from Barcrest, part of their iconic series of Rainbow Riches games. This series of games will be well known to anyone who has enjoyed playing slots online over the last couple of decades. Based on an Irish luck theme, it offers five reels, three rows and 10 fixed paylines of entertainment. Here, we will take a closer look at the game for you. As with all of the games in the iconic Rainbow Riches series, Fortune Favours is a game which is based around leprechauns and images of Irish luck. The reels are gold rimmed, and the game’s backdrop evokes rural Ireland’s green fields. The higher value symbols on the reels include some mushrooms, the game’s logo, a harp and a rainbow. As with many other games, the lower value symbols are letters and numbers. The wild symbol is the word ‘Wild’ in big red letters stamped across a gold coin. This symbol only appears in the Big Bet feature. It will substitute for all other symbols apart from the Magic Fairy bonus symbol. The Magic Fairy symbol is active in both the standard game and the Big Bet feature. When she appears she transforms into a random symbol which can create a win on the reels for you. The Big Bet feature allows you to boost your chances of winning big prizes. You can bet with stakes from £10 to £50, with each bet opening up more options for the Magic Fairy to transform and provide you with big wins on the reels. Barcrest is a very famous British gaming brand, and anyone who spent time in British seaside resorts and arcades over the last 50 years is bound to have played one of their games. Barcrest started to work online in the early years of the 21st century, which was when they produced their iconic title Rainbow Riches, which came out in 2006. Five years later, in 2011, the company was acquired by SG Gaming. SG Gaming is a giant of the industry which has acquired many other gaming companies over the last decade or so. Barcrest continue to produce cabinet fruit machines for real life casinos too, continuing a long tradition. Rainbow Riches Fortune Favours fits right in with this iconic series of Barcrest games, in terms of the quality of its gameplay and the entertainment it provides. Anyone who enjoys playing slots online should find plenty to enjoy in this game. The Big Bet feature allows you to up your stakes and potentially win some really big prizes, though this feature should be used with care.Make sure you look out for Fortune Favours in your favourite online UK casino!